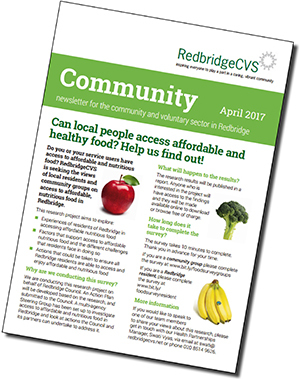 Community is our monthly newsletter, by and for the voluntary and community sector in Redbridge. Community allows groups to share their good and bad news and find out about public sector initiatives that affect them. Community sums up the best of the previous month's content from our website. Community is emailed out on request to our members and supporters, and is available for anyone to download from our website (see the column on the right). We want Community to reflect the voluntary and community sector in the borough, both our successes and the challenges we face. We encourage groups to send us articles – with photos if possible – on their successes, problems and the issues important to them. We can also have a chat with you and write an article ourselves, if you'd prefer. We produce Community as a PDF file. Members and supporters can receive Community by post, on request.